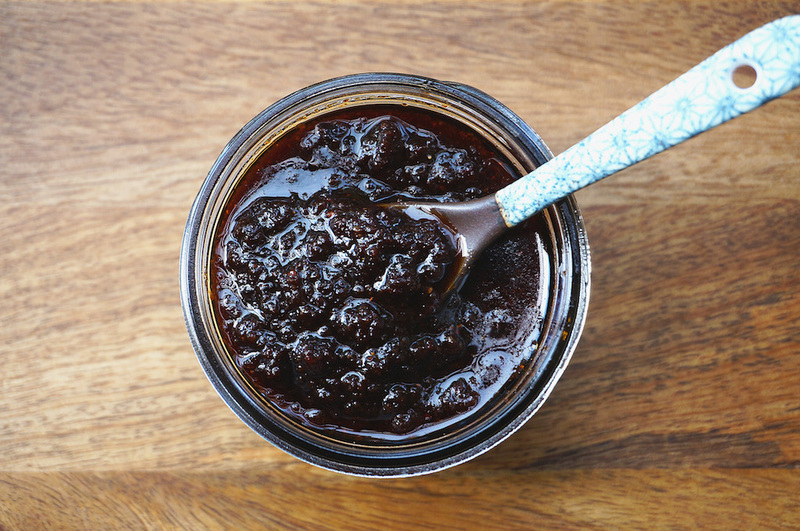 Thai Roasted Chili Paste, also called Nam Prik Pao, is a slightly spicy, sweet, sour, and salty condiment. It is made with dried chilies, garlic, shallots, dried shrimps, roasted shrimp paste, palm sugar, and fish sauce. The paste itself is very tasty and is used in many Thai dishes, such as, Tom Yum soup, stir-fried seafood, fried rice, etc. Fry shallots, garlic, and dried shrimps separately with peanut oil until crispy and golden brown in color. Then drain, set aside and reserve the oil. Dry fry the chilies until crispy and slightly darker in color. Set aside to cool down. Process all the ingredients in a food processors until you have a fine powder, or pound them in a pestle and mortar. Place all the pounded ingredients in a pan or wok, over moderate heat. Add reserved oil, palm sugar and mix well. Add more peanut oil if the paste is too dry, about 2 to 3 tablespoons. Then mix in the tamarind paste, roasted shrimp paste, fish sauce and cook until the sugar dissolves and the paste has thickens. Let it cool completely before storing it in an airtight jar or container.